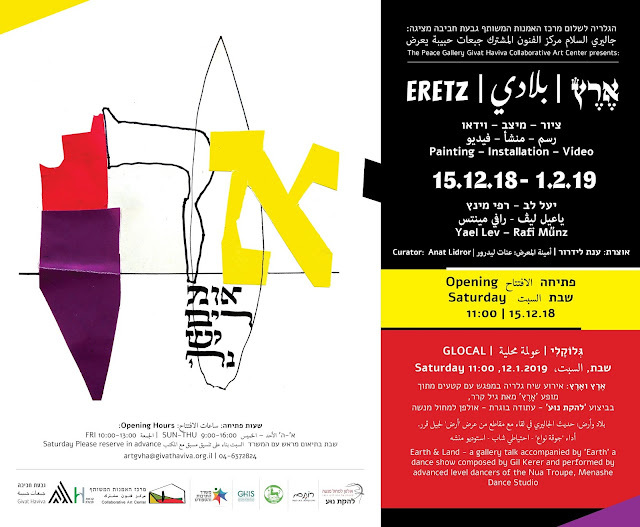 Eretz is a combined exhibition by the artists Rafi Münz and Yael Lev. It is a song of love and concern for our country, a collection of sounds and melodies begging to be heard together in a spirit of playfulness and humor: means, perhaps, to sense the blend of feelings everyone has for this country where we were born or where we live. Mixed feelings, of love / hate, remoteness/intimacy, resistance/acceptance, friendship and concern, a deliberate look at our country, which as such is able to express, comment and do; a look that contains protest but is not helpless and is free of victimhood. 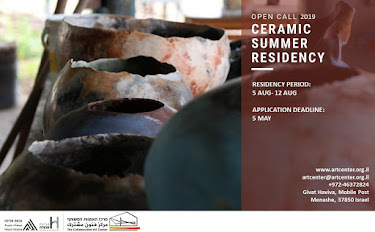 This exhibition was poured from the outdoors and born into the space of the Peace Gallery. "We covered serious mileage on land, air, and sea while "shooting pictures" at different times of the day, on various sites and on various subjects (Rafi). This is the internal and external journey taken by Rafi and Yael in 2018, a year that marked the 70th anniversary of the State of Israel. In two personal voices dancing together, they raise a big question for this country we all live in: What was it? What happened to it? What is it today? And, how does all this live within us? The journey speaks, as well, the voices of entire groups of people living in it: young people, some of who are leaving for Europe (Jews and Arabs alike); senior citizens who often sound the voice of no longer recognizing their own country; agriculturists and residents of rural areas, kibbutzim & moshavim; Jewish and Arab, that once produced and worked the land and today are practically erased or are being driven from the possibility of working the land; groups with an ecological outlook and an ever-expanding understanding that today ecology is not a luxury but a necessity; groups that believe in shared life and still remember the cooperation that existed in the distant past. 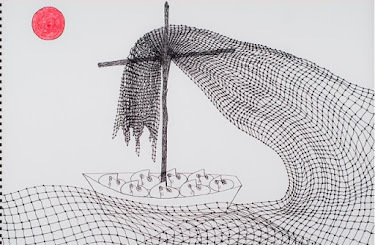 Finally, the secular public or pluralistic public that find it difficult to see here today the narrative of the country which it knew, or find its own place in light of the growing processes of religionization and radicalization. Components of the exhibit work on a wide range of senses thus expand the visual glimpse of shared experiences: simple and complex painting, realistic and expressive, graphic and sculptured, abstract and verbal, text - painting, relief and installation (Rafi), moving pictures of concrete images or abstract reality by the movement of the camera / movement of traveling, voices, sounds and improvised music projected from two projectors (Yael). 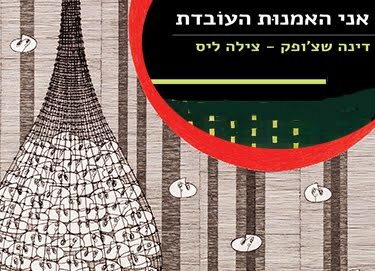 "The collection of sensations that I am feeling today, when I say “Eretz”, emphasizes simultaneously the resistance and the impossible and irrevocable connection between my country and me." (Yael) Yael weaves together and moves freely from artistic conventions on the continuum between documentary and art. She avoids the definitions such as video art and relates almost equally to image and sound, as well as the concrete and abstract. She works through the trembling and the personal as well as the thorough and investigative. Rafi, a veteran conceptual artist who creates a conceptual graphic dialogue using the language of graffiti art, specializes in combining precise techniques with sloppy techniques and "correct" techniques with techniques that do not conform to "acceptable rules for painting." Rafi challenges the space outside, available and visible to all (walls of buildings, fences and barriers, boards, and other parts of the road are a platform) with subversive content, like a "court jester," and thus makes it possible, perhaps, to be "digestible." Do humorous art and silliness have a place of honor in the art field today? Just as the brush and the colors are the tools of Rafi Münz's work, so is the spirit of nonsense and humor. These allow multiple meanings and cathartic liberation. It might be exactly what is required today for the sake of being able to live and to deal with the conflictual content of our country. Rafi speaks;Yael works through underground feelings, non-verbally. This honorable, inspiring artistic friendship exists in cooperative actions over the year between the two. In Arabic,“Eretz”(country) was translated into Biladi (my country, a multi-layered expression). Rafi and Yael cannot bring a personal outlook, in first person, of the Arabs living here, who will certainly not call their land the Land of Israel (a pair of words, some of which equate to the expression Greater Israel). However, they can see and revive this country as a country with a joint conception, to create the space in this exhibition to express it and choose to call the exhibition in Arabic- Biladi, and not just Bilad. “Eretz” is the landscape of our childhood, the country we love so much and refuse to leave, but the life in it, its processes of growth and change, hold in us feelings that move back and forth between those memories and tender feelings to the contemporary feelings and sensations. Those eventually are forced to live together inside us. Times: Sun.-Thu. 9 a.m.-4 p.m. | Fri. 10 a.m.-1 p.m. | Sat. by appointment.